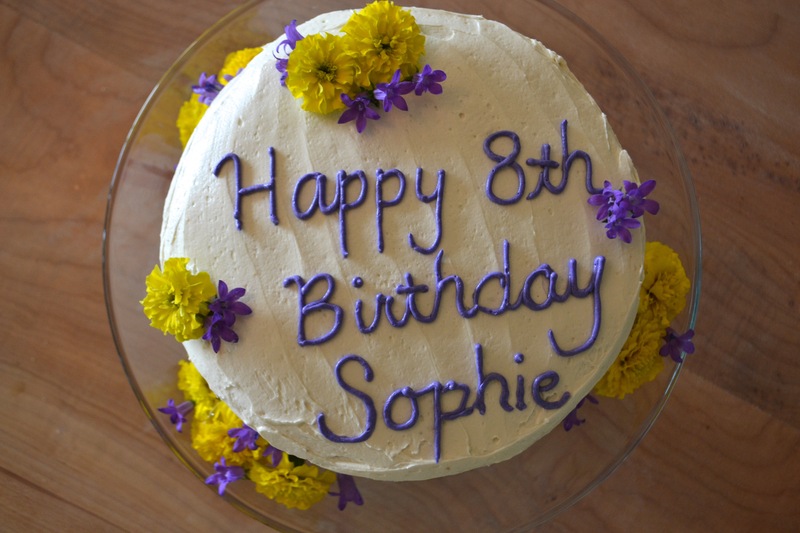 Both my kids were born in the month of June–one week apart, so I’ve just completed another year of birthday party planning, cake baking and decorating and gift bag assembling. 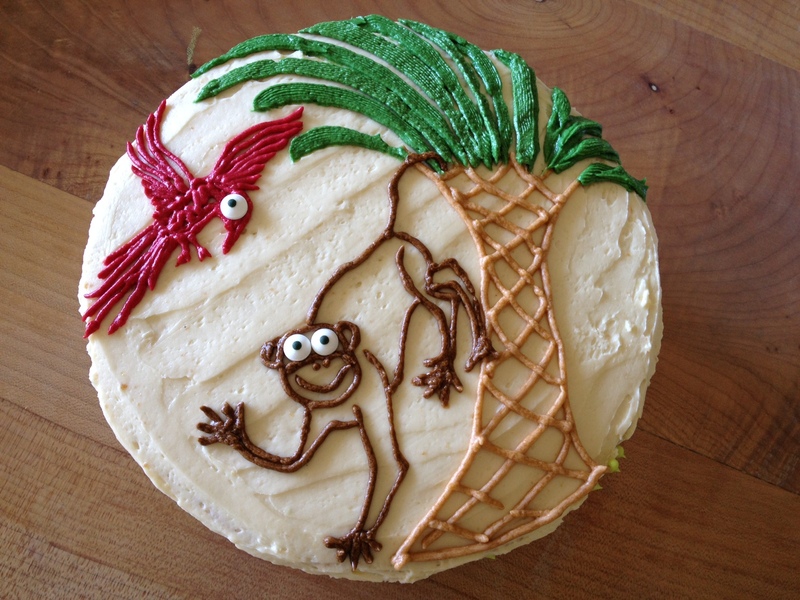 As luck (or misfortune) would have it, my son asked me to decorate his cake with the following: a scarlet macaw; a howler monkey; and a gecko. This certainly challenged my artistic abilities, and I had to Google these creatures to even begin attempting to take them from photos to squiggles of frosting. The first comment is that even though this recipe is for a moist, delicious, gluten-free cake, the low-sugar frosting recipe that follows does contain gluten. It contains very little–just 1/8 cup, but it is in fact the little flour that enables you to make a smooth, creamy, not-to-sweet frosting. Since I’m not celiac or even gluten intolerant (verified by my recent food sensitivity test), I don’t have any issue with the tiny amount of flour in this frosting. 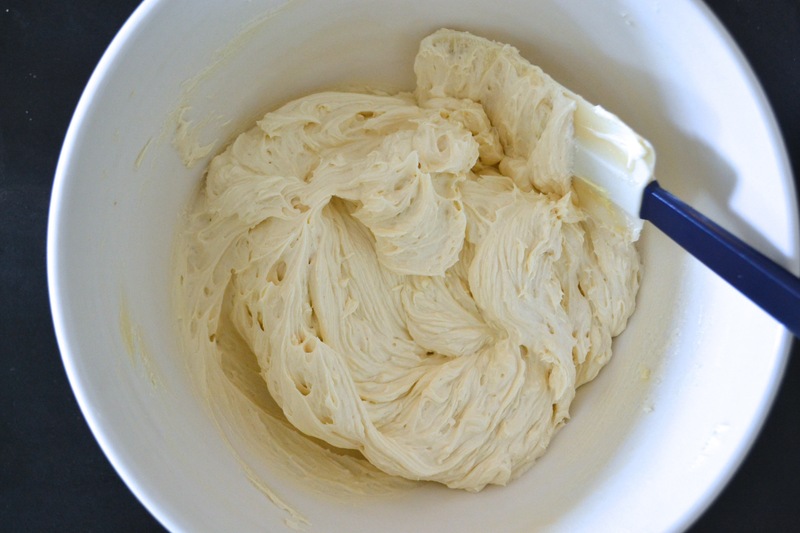 If you are avoiding gluten all together, but still want a great, low-sugar frosting, you can probably make this recipe substituting a GF flour for regular. I haven’t tried it yet, but if I do and the results are good, I’ll be sure to mention it in a future post. I also wanted to note that the even though the frosting starts out looking quite dark–a beige color really–once you whip in the butter, it gets near white. Here are before (butter) and after pictures. Using orange zest can make the flavor too strong for some younger, less-developed palates. You can make a more “plain” flavored cake by simply omitting the zest and using the white wine. A touch of lemon zest works well if you plan to make a fruit filling instead of the chocolate. In case you missed my original post, here are the recipes again. The following quantities are for 1 full 9-inch round. Double the recipe for two full 9-inch rounds, or three medium-height 9-inch rounds if you love fillings. Preheat over to 350-degrees Farenheit. In a medium-sized bowl, mix together flours, baking powder, baking soda and salt. Set aside. If making the butter version, beat the butter in a large bowl with a hand-held mixer until creamy. Beat in the sugar. Beat in the eggs one at a time. Beat in the orange juice/yogurt mixture and vanilla until well-blended. Stir in the dry ingredients until well-blended. If making the olive oil version, whisk the eggs in a large bowl. 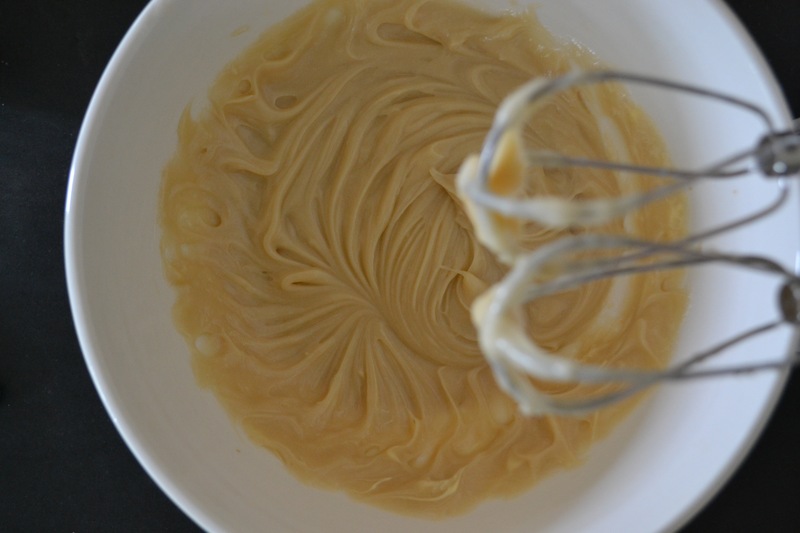 Whisk in the sugar then the orange juice/yogurt mixture and vanilla. Stir in the olive oil and dry ingredients alternating one-third to one-half of each until well-blended. Pour evenly into cake pan(s). Bake for 35-45 minutes or until a toothpick inserted comes out clean, and the cake is springy to the touch at its center. (Mine are always golden-brown by this stage.) Cool in pans. Use a slim knife around the outer edge to loosen the cake(s) from pan. Turn out carefully and let further cool on rack(s). My favorite during summer months is to simply macerate fresh strawberries and raspberries to which I’ve added a little lemon zest and vanilla extract. This mixture is fairly liquid and soaks beautifully into the cake layer(s). 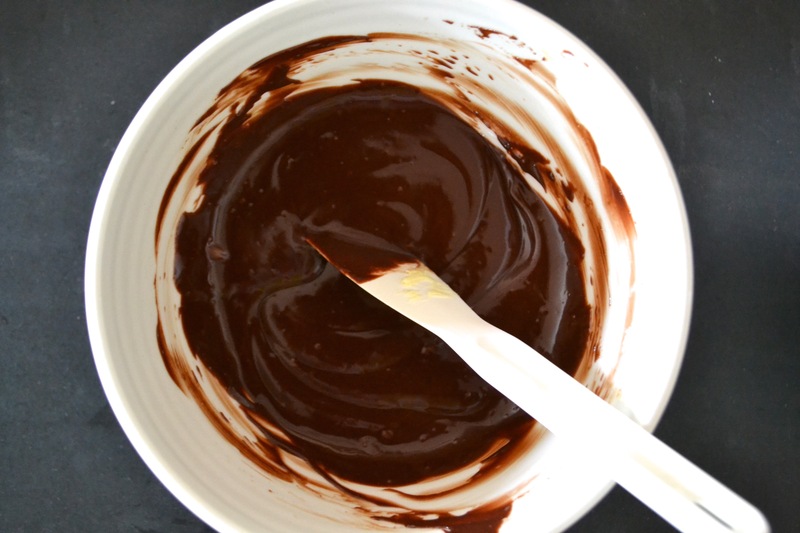 Finely chop 3 1/2 oz dark chocolate (preferably at least 70% cocoa), and place in a medium-sized bowl. Bring 1/2 cup cream to near boil. Pour over chocolate. Stir until completely melted/blended. Stir in 1 tbsp. butter and 1 tbsp. agave syrup. Let cool. (it will thicken considerably). Stir well before spreading on cake(s). Here’s a photo of the ganache while it is still warm before it cools and naturally thickens. This recipe makes enough to frost a 2-3 layer cake. Increase proportions if you plan to bake more layers or want lots of extra frosting for additional decorating. In a medium bowl, whisk the sugar, flour, cornstarch and salt until there are no lumps. Slowly whisk in the milk until the mixture is smooth. Pour the mixture into a saucepan. Cook over medium heat, whisking frequently increasing to constantly, until the mixture bubbles/boils and becomes very thick. This takes roughly 10 minutes. Transfer the mixture to a clean bowl and cool to room temperature. This step is extremely important! If it is even slightly warm, the frosting come together properly. On a fall day in California, this took a little over 2 hours. You can speed up the process by putting the bowl in the refrigerator. However, if you do this, be sure to take it out in time to for it to warm back up to room temperature before proceeding to the next step. Once the mixture has completely cooled to room temperature (you will feel no trace of warmth when you place your hands around the bottom of the bowl), beat in the vanilla using a hand-held mixer on low speed. Next, beat in the butter, one piece at a time, until fully incorporated. Increase the speed to medium-high and beat the frosting for five minutes, until it is light and fluffy (approximately 5 minutes). Spread with a soft-tipped rubber spatula. This recipe looks great! Thanks for sharing! !